Donald Trump -- or companies that bear his name - have declared bankruptcy four times. Trump has built an American empire from Las Vegas to New York with towering hotels and sparkling casinos. Forbes estimates he's worth $2.7 billion. But not all of Trump's business ventures have been constant money-makers. In 1991, 1992, 2004, and again in 2009, Trump branded companies or properties have sought Chapter 11 protection. "I've used the laws of this country to pare debt. ... We'll have the company. We'll throw it into a chapter. We'll negotiate with the banks. We'll make a fantastic deal. You know, it's like on 'The Apprentice.' It's not personal. It's just business," Trump told ABC's George Stephanopoulos last Thursday. A business declaring bankruptcy is nothing new in corporate America, where bankruptcy is often sugar-coated as "restructuring debt." But it might seem alarming to everyday Americans who can't get a bank to restructure their home loans. If you want to get Donald Trump hot under the collar, accuse him of declaring bankruptcy. Doug Heller, the executive director of Consumer Watchdog, said Trump is the "most egregious, almost comical example" of the disparity between what the average American faces when going through bankruptcy and the "ease with which the very rich can move in and out of bankruptcy." "Under the American bankruptcy laws, if you end up in bankruptcy because you're struggling with divorce or medical payments or a sudden change of income, it's a disaster. If you fail miserably with huge dollars involved then you just need some accountants to rework your books," Heller said. The multi-billionaire touts his huge net worth and big business experience as qualifications for his possible presidential run. Trump recently bragged that he has "a much bigger net worth" than Mitt Romney, who he said is "basically a small business guy." "I'm a much bigger businessman. … I mean, my net worth is many, many, many times Mitt Romney's," Trump said. The big business man has wrangled with big debt in the past 20 years. 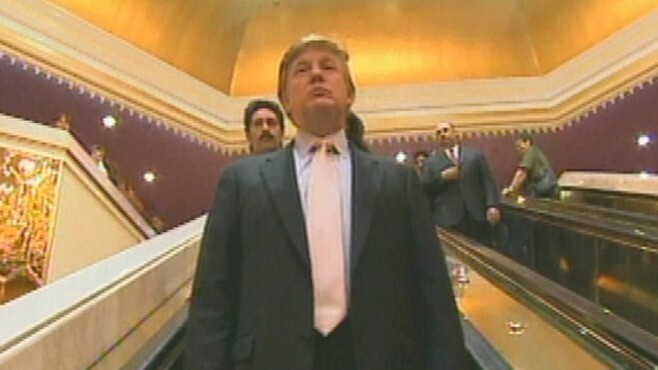 Trump's first visit to bankruptcy court was in 1991, when his Atlantic City casino, the Taj Mahal, was buried under a mountain of debt. The Taj carried a $1 billion price tag and was financed by junk bonds carrying a staggering 14 percent interest rate. As construction completed, the economy slumped, as did the Atlantic City gambling scene, soon plunging Trump into $3.4 billion of debt. "[The banks] could have simply taken everything he had right then, but they wanted his cooperation," said Lynn LoPucki, a bankruptcy expert and professor at UCLA Law School. "There's that old saying, 'If you owe your banks a little, you're at their mercy. If you owe the banks a lot, the banks are at your mercy. They saw the best way for him to repay the money was to keep the Donald afloat." The Donald struck a deal with the banks to hand over half his ownership, and half of the equity, in the casino in exchange for a lower interest rate and more time to pay off his debt. He sold off his beloved Trump Princess yacht and the Trump Shuttle airplane to make his payments, and his creditors put him on a budget, putting a cap on his personal spending. "The first one was a really big hit for him. They had him personally, and he ended up taking substantial losses in that bankruptcy. He also had the humiliation of having some bankers deciding how much money he could spend -- the numbers are just astonishing -- the amount of his monthly budget," LoPucki said. John Pottow, a bankruptcy expert and law professor at the University of Michigan, said banks would often agree to lose millions in reorganizations like Trump's to prevent the massive losses they would incur if they foreclosed on the property. "Banks will take considerable haircuts," Pottow said. "It's sort of like you have a sick patient so you cut off a couple toes to stop the gangrene. Now he's missing a few toes, but he's still alive." Just one year after the Taj Mahal deal was struck. Trump was back in court, again "restructuring" his debt. This time the Trump Plaza Hotel in Atlantic City was in the lenders' crosshairs. Trump owed $550 million on the hotel and agreed to give up 49 percent of the hotel to Citibank and five other lenders. In return, Donald Trump was given a similar deal as before, with more lenient conditions to repay the debt. The Donald stayed on as chief executive, but his salary was taken away. "Here's a guy who's failed so miserably so many times and it's not as though he had to claw his way back after seven years in credit hell. He just said. 'OK, this isn't my problem anymore.' For him, it's just been a platform to the next money-making scheme," said Dough Heller, the executive director of Consumer Watchdog. In 2004 Trump Hotels and Casino Resorts Inc. filed for voluntary bankruptcy after accumulating $1.8 billion in debt. The Donald agreed to reduce his share in the company from 47 percent to 25 percent, meaning he no longer had control over the company. The deal also included lower interest rates and a $500 million loan to make improvements. "In 2004 is where he lost control of his name. One rule when you have a name like Trump is you never let anyone own it and control it. He got into such a bad spot here that he ended up with others owning and controlling his name. They can do what they want once they own it," LoPucki said. Shortly after the proceedings, Trump told CNN's Geri Willis that his personal fortune would not be affected. "This is a very small portion of my net worth. It's less than 2 percent," he said. When the economy turned downward in 2008, so too did Trump's real estate holdings. Trump Entertainment and his affiliated companies had $2.06 billion in assets and was $1.74 billion in debt. In December 2008 his company missed a $53.1 million bond interest payment, propelling Trump Entertainment Resorts into bankruptcy court and plunging its stock price from $4 per share to a mere 23 cents. This time, Trump fought with his board of directors over the restructuring and ended up resigning as chairman of the board. He emerged from a messy, months-long process with a 10 percent share of the company. LoPucki said it was very unusual for anyone to have that many large businesses go through bankruptcy. Most of the debt Trump incurred was through bonds that were sold to the public. "People knew who Donald Trump was and for that reason were willing to trust the bonds, and they got burned," LoPucki said. "The people who invested with him or based on his name lost money, but he himself came out pretty well." ABC News' Kristina Bergess and Nick Gass contributed to this report. +Is Donald Trump the Republican Front-Runner? +Donald Trump: Political Sideshow or The Real Deal?